Prompted perhaps by the steady improvement in driverless car technology, it occurs to me that we perhaps have many jobs that are soon to be things of the past. An article by Jeff Selingo caught my attention. I explore here using his article as a starting point. What is under discussion here is the knock-on effect of technology. A 2013 study concluded that 47% of total US employment is at risk. It also concluded that wages and educational attainment exhibit a strong negative relationship with an occupation’s probability of computerisation. Which is to say that there are many jobs ripe for computerisation, being those with well-defined procedures that can easily be performed by sophisticated algorithms. This generally moves workers from middle-income manufacturing to low-income service occupations. How long will it be before we need significantly fewer long-distance drivers? Quite clearly the driver-less vehicle is on its way, but there will be a long period where there will remain a need for the ends of the journey to be driven by a human. We may have an insistence that there be a ‘driver’ much as we have for trains already in the UK. A job more of supervision than driving as it has been understood. This applies just as throughly to other forms of transport; pilots are increasingly highly trained passengers for much of a flight and until things go wrong. On the roads I can envisage a national insistence that there are NO driverless vehicles but that all vehicles must have a human at the wheel – equivalent to the air pilot. If we go the other route, then I see what will amount to freight terminals (termini) probably as motorway adjuncts, at which human-less vehicles collect what amounts to a shipping pilot. On balance I think it is most likely that for a long time we will have a human on board and that this role will steadily change to include tasks more akin to management, though everything I can think of that might be included is also likely to disappear from technological improvements. Selingo tells me that the number of drivers is very large, 3 million truck drivers in the US, making it the most likely job held by a man. In the UK, while we have a lot of full-time drivers and delivery people, it is the demands of the end of the journey—the delivery itself—that makes the task more difficult to complete by driverless means. Not impossible, merely more difficult. It is perfectly possible that we have, in the not too distant future, sufficient driverless vehicles that the human driver becomes the problem. Obviously fuel costs will play an important part but it is too easy to see (and indeed I have read about such scenarios for decades) that with good enough imaging we would not need to travel to physically share space with people. At a mundane level, just review how Skype can remove the need for face-to-face interviews, and then take that not very far into the future. Which moves us from the issue of vehicle control to the need to move oneself (as opposed to goods) around, leisure excluded. Do we need so many administrative assistants? This is the top US job for women and is similarly under attack. ³ In the UK and in response to a change in pay scales, men are moving into PA roles, though it tends to be called ‘executive assistant’. This is seen as a direct consequence of a reduction in manufacturing (source, ONS). In the UK (ONS, same paper) employment rates for men and women have moved from 92%:53% in 1971 to a far more equal 76%:67% in 2013. However, gender issues are not connected to likelihood of displacement by technology, though you may wish to explore that idea separately. I can see that there will be more equalisation as both technology improves and society adjusts to the change in opportunity. As above, men are moving into PA roles simply because there is a market in which they may succeed that pays relatively well. In general, and as computing costs continue to fall, so occupations requiring cognitive skills (problem-solving, analysis, art production, design and so on – please add to this list) are both in demand and relatively productive. ² Similarly jobs requiring social skills are relatively immune to computerisation. This pushes employment to the poles, to high-end thinking intensive roles and to low-end manual and service roles. Many jobs require face-to-face (f-t-f) 10 communication. I think that this will steadily be divorced from the need to share location as communications improve and transportation becomes more expensive. That may mean there will be a significant premium placed upon the f-t-f moments, as I think is already happening; if a sale is significant, then the cost of travel an be trivial in comparison to the opportunity cost, which in turn adds to the traveling done and to the value perceived in f-t-f moments. That leaves the jobs where there is a need to share a specific location. These are not solely jobs in manufacturing. To add to the converse side of this point, where jobs do not require a specific location, such jobs are ripe to be moved, possibly off-shore. A good deal of such jobs then rely heavily upon there being good communication available. An exception might be where tasks are sufficiently well-defined but still not susceptible to replacement by technology; all of which pre-supposes someone with the cognitive skills sufficient to divide larger tasks into component parts. I can see there being whole offices that meet intermittently at non-company locations for the purposes of team-building, setting common standards, re-education – but in the interim everyone largely works from home or some other local desk space with excellent technology. We should not only distinguish between cognitive and manual tasks, we should distinguish between routine and non-routine tasks. I feel there is a range of cognitive tasks, but identifying what is routine is something that we can work to enlarge. As we do that, so we move more to the place where automation can take place. Looking at available literature, Autor et al (2003) make this very distinction. What is subsequently identified as non-routine included truck driving, medical diagnoses and legal writing, all three of which are heading towards automation in the next ten years. Persuading and selling, you would think, will continue to require human inclusion, at least as long as it is humans that are being sold to. Many Sci-fi writers see selling as a prime example of an automation space, leaving the messages to be pushed as the creative element. Evidence in support of this is found throughout your social media. As humans we will adapt and survive, even within our own societies – we can find new uses for labour. ⁸ What we are seeing is an increasing trend for people with lots of education to end up doing low-grade jobs. This may also reflect life-choices, but as computing oozes into cognitive domains this is a trend of which we will see more. One of the things about which one might wonder—even marvel at—is the move from what was non-routine. In the late 20th century mundane tasks for people such as reading a cheque signature or driving through a city were well beyond computer capability but we are getting close to regarding those two tasks as routine (in the sense of being possible to be done by a machine) just twenty years later. That suggests that within the working life of many people now in employment there will be significant change, and there is little reason seen for that race of progress to change to something slower, short of another global war. [ideas from Veres, 2011, from Plotz & Fink, 2009 ², p16]. So, if I were in the business, I’d be looking to explore ways to detect the non-standard event. I looked just a little and found the tern ‘novelty detection’. Quite what one would do with such an event (‘pass it to the human’ is my first thought) is less clear. Right now, that would be sufficient; send the mobile, flexible, adaptable human unit to go find out what might have caused the novelty event. No doubt that will raise the productivity of the humans, while steadily lowering the number of humans required for any given (low-level maintenance) task. Imagine: for many such events the result will be to tell the bigger machine to run a 3-d printer to generate a replacement XYZ part. Soon enough, we will have taught the machines to do the replacement activity. Increasingly, the novelty events will become rarer, or if you like, less manageable; after all, if it could be managed, the machine would have fixed it. Some onsite jobs would become very lonely and we might as well get out into space. For that we need a surplus of energy and quite possibly a good deal fewer unproductive people. We could too easily suffocate our own progress. As Selingo ¹ points out: The question that [we] should be discussing now is what kind of education is needed to stay ahead of automation, or more likely, to complement technology. He points to what he calls ‘middle skills jobs’, which require something more than school but less than a degree and he identifies specifically the near 50% of US jobs that lie in advanced manufacturing, health care, and information technology. Several sources (e.g. Accenture) identify shortages in these skills (whatever they are). As I have identified in other essays, educators are fixated on the drive to university, but in the US we have around half failing to finish (finish at all, finish in four years, finish what they started, these add up rapidly), which says to me that the image presented is not matching the actuality, which is a selling problem that requires a large-scale approach to a solution. Matters in the UK are not so severe, where we are told of increasing numbers of males now not going to university but chasing what would have been called apprenticeships – effectively, more direct routes to employment than a degree course usually offers. See Essay 231, among others. (iii) provision of job skills within national education schemes. One of the incremental changes in offices is an evolution from a place for employees to come and use fixed capital equipment such as fax machines, desktop computers and fixed landlines; often in isolation and with a specific definition of employees’ workspace, to a more flexible model, where the capital equipment is increasingly mobile and offices are becoming more orientated to maximising employee interactions. (Strutt & Parker). The focus is on employee ‘wellness’ and upon productivity, helping employees work at optimum. Picking from the report and considering all the talk of collaboration and co-working, I was interested to see that (this survey taken across offices in Greater London) the survey asked what typical activities were, not what proportion of time was spent in them. So a third of respondents listed formal meetings and a fifth informal meetings as typical activities, with no indication of whether this amounted to a large part of every day. However, using this crude measure, I was unsurprised that commuting time was an important consideration for almost all (when asked about office location), followed closely by food/drink options. Such is work in London, I surmised, since little of that has been reflected in my own experience. In previous industrial revolutions productivity increased and the demanded skill levels fell. ⁶ The whole point of automation was to reduce the (expensively learned) skills of the specialist artisan to relatively unskilled tasks, even if that increased the number of separate tasks. The addition of power tools (I’m thinking steam power around the end of the Victorian era, end of the 19th Century) was a given. The modern equivalent is little different. There are many tasks we can automate, once we have sufficient collected information. Where for Victorians this applied to manufacturing so for us this applies far more to processes in general, including many that previously we thought were immune to modernisation, however technological. Which seems a contradiction but is exactly what we have been doing. Take medicine, where we have extremely skilled and highly trained individuals employed. Yet we can do diagnosis with expert systems that have access to far greater data (no, it is not complete, even if updated), and so can provide a probabilistic response. That doesn’t get around doctor-patient interaction (yet, much) but it currently gives both parties evidence of the necessary work. What has happened is that expectations have risen to exceed what health systems can provide, as much a finance problem as a medical one. It also leaves open the issues of data quality; how data is categorised, who decides how it is categorised. Example from watching Wimbledon in 201707; ‘aggressive strokes’ was the subject of a count: Who says? How did they judge that? Surely very subjectively. Essay 236. We’re seeing changes in the way our cars are serviced; on mine, a lot of the car info is held somehow on the ignition key, so the garage can tell me something of the health of the car without the car, and a lot more when they have the car to interrogate, still without applying any tools to the vehicle. I look forward to the days when my house behaves similarly, I note with amusement that, while looking at property in Manchester we were told that car security is now markedly better than house security. One consequence of that is that insurance companies perceive positive value in on-road parking such that the car is not identified with a house (better still, off-road parking not attributable to a house). Why? Because the car is secure but the keys are far less secure, probably just inside the door of the obviously associated house. Breaking a door, taking the car key and the car is now far easier (and quicker) than breaking into the car and stealing it with no key. In turn this means that one now needs to encourage change in domestic security attitudes. So how should this affect us? Me, hardly at all; I’m retired, I’m comfortable with technology and enjoy new developments. For those in employment I’d suggest you apply some thought to your replaceability both in your current job and its associated business. [Don’t ignore such a warning; it is far too late to begin thinking about it after you’ve been made redundant.] For those not yet employed, I’d put some thought into acquisition of skills of value. Which of course applies to those in work too. Much though I may dislike Tony Blair, he was right when he pointed out that many of us will have four or five careers before retirement and that in consequence we needed to understand the concept of life-long learning. Which has at least two components; (i) that which applies to all work and we might describe as general education, but including continued development of skills such as language and technology, and (ii) those skill specific to a class of work (career, perhaps), which might include professional qualifications and certifications, conversion courses, attendance courses, generally keeping up-to-date with your profession or business. Of course, it has never been clear how such things would ever be funded: for the employer there is too much evidence that up-skilling your employees is followed by them leaving (so there’s a powerful disincentive); for the employee, funding any course is a strain on two essential resources, time and money – and there needs to be a (more) significant perceived gain from that work and expense; for the state, it is clear that resources can be spent very productively in educating the work-force, but it is equally clear that only rarely does the evidence say that those same resources have been productively used. Which strikes me as something we ought to value and reward the smart use of – responsible politics simply doesn’t happen when everything associated with politics and politicians is so very short-term. Which in turn means that the only way to proceed is to hive off the application of resources for education and training and to hold some separate far less political body liable for the sensible, measured application of resource for result. Essays 229-234 apply, especially 231. Not unlike Team GB providing value at the Olympics. A different issue entirely? Discuss. Essays welcomed. In the same way that the development of the production line system increased the number of tasks but reduced the task complexity, so that same approach will move even some of those tasks we currently think we can consider safely non-routine into the compass of automation. We excel at the non-standard, we are pretty good at having ideas but we are less good at handling detail (e.g. adapting our design to meet regulations without making that compliance drive the design itself). Thinking of construction issues, much non-standard work can be dealt with at design stage so that, at some level, the work is surprisingly standard. So reduction of the variability without necessarily sacrificing all innovation, is possible and, I suggest, desirable. The issue of perception and manipulation will improve and robotics needs a drive to work on this. The ideas involved in construction fall into this category, as discussed briefly above. So does any effect of weather on work carried out by machinery. Many of these problems as presented at the moment merely require a little thinking outside the box. “What is it the the machine can do to achieve the effect we want?” is not the same as “How do we get the machine to do what humans do?”. Simply frame the question the right way and there is no problem; a mathematics thinking problem, then. One of the tests for robotics is what to do upon failure, e.g. dropping an object (presumably something markedly irregular or particularly slippery or mobile). Another issue is with tactile feedback, though I read that where this has been required to date there has been some easy workaround that avoids the urgency of need. Creativity is what we do when we come up with a new idea, whether that is a mental construct or an artefact. But it is not difficult to generate novelty since, once we can identify ‘what we like’, then making a machine generate ‘stuff we will also like’ is relatively straightforward. Which leaves more extreme newness to be discovered, as I have been reading in future environments in sci-fi novels for most of my life. Like, since 1960? Social intelligence applies when dealing with each other. This is where we use persuasion skills (not just in selling), skills of negotiation, psychological skills such as in nursing. I wonder whether there is significant gain to be had in trying to move automation into this field. 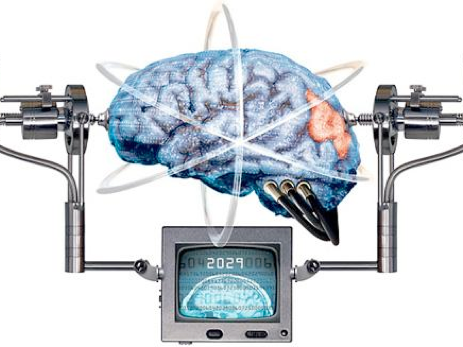 To my mind from an engineering point of view we can automate most of our lives and what is left is our problem, mostly dealing with each other. All of this points to a future where we have three sorts of people; the clever with thinking work, the not-so clever with basically manual work and the masses in between with nothing much to do but get in each others’ way. It could be that the masses are left to be creative, but the trends within social media suggest to me that we are more likely to be staring at our navels than going off to find things to do. Perhaps this is the big problem for our social scientists (just maybe I mean political thinkers) – can we find something productive to do when productivity has moved into automation? What services can we provide to each other that are of worth (interchangeable value)? We have many painted futures in the written literature (again, it’s called sci-fi, or SF) and we need not pick any of these but can choose to find our own. Meanwhile, it seems clear to me that the only sensible action any individual can take is to increase their education to the point where they either fall into the top productive category or they can squeeze into one of the businesses that has not yet been automated. And by education, in this instance, one must mean the addition of content that is useful in adding skills and knowledge relevant to the future needs of that individual. I wonder how many people are able to steer a way through such difficult waters; it seems likely that the answer is a similar number to those who make it into that elite future groups employed for their thinking skills. The only other rich people will be salesmen, in some form or other. Do you think that social services will change its perceived value in society? 1 Jeff Selingo Author of the New York Times bestseller, There is Life after College, a Washington Post Writer. ...our entire education system from primary school through college seems so focused on teaching skills that will be automated in the future. The jobs that are growing the most are those that require high social skills as well as analytical skills, according to David Deming, an associate professor of education and economics at Harvard University. 2 Oxford Study 17 Sept 2013; Frey & Osborne, The Future of Employment: How Susceptible are Jobs to Computerisation? 3 I cannot fail to observe the sexism in US job roles. 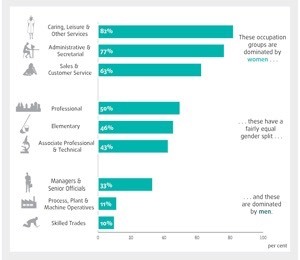 Very few truck drivers are women, (under 6%, says CNBC, 2% in UK, Daily Mail) very few secretaries (sorry, administrative assistants) are men. .... it [is] not the lack of inventive ideas that set the boundaries for economic development, but rather powerful social and economic interests promoting the technological status quo. This is nicely illustrated by the example of William Lee, inventing the stocking frame knitting machine in 1589, hoping that it would relieve workers of hand-knitting. Seek- ing patent protection for his invention, he travelled to London where he had rented a building for his machine to be viewed by Queen Elizabeth I. To his disappointment, the Queen was more concerned with the employment impact of his invention and refused to grant him a patent, claiming that: “Thou aimest high, Master Lee. Consider thou what the invention could do to my poor subjects. It would assuredly bring to them ruin by depriving them of employment, thus making them beggars” (cited in Acemoglu and Robinson, 2012, p. 182f). Most likely the Queen’s concern was a manifestation of the hosiers’ guilds fear that the invention would make he skills of its artisan members obsolete. The guilds’ opposition was indeed so intense that William Lee had to leave Britain. Level 4 HNCs } vocational qualifications run from levels 3 to 7. Making ploughs (US, plows) at the end of the 19th century; 2 men took 118 man-hours to make a plough in 11 distinct man-powered operations; a factory used 52 workers on 97 separate tasks, with steam power, completing the plough in just 3.75 man-hours. If the items and men were equivalent then this is a thirty-fold improvement, exaggerated by the factory workers being relatively unskilled and so paid markedly less. You need to factor in the capital costs, development costs, other running costs and so on, plus the inability to innovate with any ease. Making shirts, the specialist took 1439 hours on 25 different tasks to make 144 shirts, so 10 man-hours per shirt. the factory took 188 man-hours for 244 shirts using 230 staff (incl inspection and support staff) on 39 tasks, using a lot of steam power. That’s an improvement of 8 times (1sig fig); while the hand-made shirt might be better, it isn’t eight times better. That drives down the pay and production of the specialist (‘artisan’ would be the right word) while driving up the pay of the factory workers up to the region where supply nears demand. 7 In England (it is somewhat different in Scotland) the process of land (property) sale requires contract by deed. Expected documentation includes the title deeds of course (think provenance, but this is now reduced to a scrappy piece of paper that says you hold title in a national database), but also a stock of permissions and certificates for any alterations, where that includes far more than you might expect. With that we now add environmental certification, electrical certification (and no doubt this list will grow as the fear-mongers succeed in generating service-based work). So additions to the house such as solar panels would of course have certificates and guarantees to pass along, but so would a good deal of the kitchen fittings, the heating system, the electrics both general and specific. We require ‘searches’ of the locally held state paper to show that there are no liabilities or risks of which the vendor should be making the vendee aware – in effect declaring that the vendee is incompetent. I have never yet been handed old searches, when many of these would apply. So these searches would reveal the location of drainage (and whether your land includes drains for other property), who owns the boundaries (is that fence yours? ), existence of mining, flooding, subsidence (and so on; radon is an issue in parts of the UK, and earthquakes are almost unknown), perhaps noise intrusion. Yet all of this expected paperwork has holes where the occupier has lost it (or ‘lost’ it); there is little reward or penalty for the existence or its lack, so “I don’t know” becomes a wonderful let-out for avoiding things that should be declared. In England we apply caveat emptor, so once completion has occurred, you own the problems. In France, owners can be pursued for liabilities made by previous owners and one of the ‘games’ locals play on immigrant Brits is to (re-)submit bills incurred by the previous owners. So it is effectively the French property which owes obligation; here in England it is the property owner who owes, so old bills belong with the person (the other party to contract) not with the building. Very slowly it will become possible to do most of this automatically. As property is registered, so the database of who owns what steadily grows and can be interrogated (but can I do that yet? If I was a conveyancer I’d want that to be a restricted access database). As databases grow, so one can investigate say local flooding history and likelihood using several models, one can see what has been registered (EPC for example, which tells you a lot about running coasts for a building). I look forward to this being automated. More on this later in 2017, having experimented with a more automated agent. see Essay 223. 8 pointed out by John Manyard Keynes, way back in 1931, I then discovered. We are being afflicted with a new disease of which some readers may not yet have heard the name, but of which they will hear a great deal in the years to come – namely, technological unemployment. This means unemployment due to our discovery of means of economising the use of labour outrunning the pace at which we can find new uses for labour. JM Keynes, Economic Possibilities for our Grandchildren, Essays in Persuasion, 1931. Readable link. 9 Wherever humans and old systems are sources of data there will be issues of data quality. To some extent we can build machines to scan old documents, just as we can build robust systems for generating new data. But input involving people will continue to be flawed until the machines do this for us. Even then there will be issues with interpretation, with the gap between what is measured and what needs to be known – a standard management problem far too often not dealt with. So I see a future in data quality maintenance and in those roles where management remains incompetent at providing its own ways to inquire of the data for non-standard information (example, almost anywhere within the medical sector). From a machine and system perspective, all human input is faulty and some is merely less flawed than other input. It is not just that we are not terribly good at following the needs of machines (and there’s a wealth of wrongness in us serving machines), it is also that we are actually better at non-routine matters. or, perhaps, at spotting a bigger, more general pattern. So that leaves hope for maths and for teachers. But even that doesn’t mean there is a long future for teaching, not as we know it at the moment. But don’t get too excited: source  quotes another source: estimates by MGI (2013) suggests that sophisticated algorithms could substitute for approximately 140 million full-time knowledge workers worldwide. 10 Known as dancing: Chris Sillitoe and I, trying to indicate a need to meet face-to-face on Dartmoor (me loose on the moor, him nominally tied to a vehicle), by f-t-f meetings, pronounced on the radio, of course, as foxtrot tango foxtrot. Inevitable, wasn’t it, to call it dancing? See essay 170, too. Which means we would meet at his vehicle, location known from earlier conversation, in the 25 minutes it would take me to get to the vehicle. If the answer was, say over 40 minutes, it is likely he would turn down the dance, to be put later on his card. Or mine, depending who asked first. Little things to amuse all those using radios, a medium in which any transmission is heard by all those within reception range. Of course, a few of the kids would understand completely, while many would recognise this was code for something, and no doubt a few had dark thoughts what we might be doing. Like extra food, or a lift ahead. Such are the teenage years. • self-motivation (is that learned? ), analytic skills, communication skills – these may be included above already.